I was attempting to restore some order to my bookshelf when I came across a book I had almost forgotten about but one that deserves a post. A couple of years ago, I found myself contemplating my relationship with myself and others . While I did desire a fruitful social life, my desires didn’t seem the same as other people in their early twenties. Basically, I was becoming increasingly aware that I frequently craved time alone and often enjoyed spending time alone rather than in the company of many people my own age. So I did a bit of research and bought ‘Solitude’ by Anthony Storr. 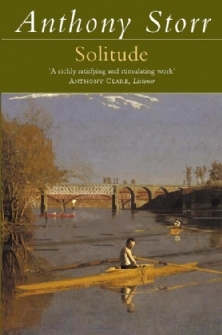 This time I didn’t want something self-helpy; I wanted something more scientific and evidence-based to give me an insight into my own desires and preferences so ‘Solitude’ seemed to tick the right boxes, what with Storr being an eminent psychiatrist. Quite simply, it’s a very good book. It explores the various dimensions of ‘solitude’, and brings to light the importance today’s society places on ‘intimate interpersonal relationships as the touchstone of health and happiness’, which Storr points out is a ‘comparatively recent phenomenon.’ Previous generations focused on survival and earning a living, but nowadays, in developed countries, it seems that the arena of personal relations causes the greatest concern. Storr argues that this ignores the importance of less intimate relations, the need to feel part of a bigger community, the need for a function and a place. Too many psychological studies emphasise that life revolves around personal relations but what I like about Storr’s approach is that he sees that this is not always the case. People that lack intimate relations can still enjoy meaningful lives – although it might be more difficult, it can certainly be managed and such a pervasive belief that personal relations determine meaningfulness is damaging and entirely ignores the fact that people are complex creatures, that come in different shapes and forms. I found this idea really refreshing and reassuring; reading it felt like a comforting pat on the back against a society that often classes solitude as something to be looked down upon. I wouldn’t hesitate to recommend this book. Those that find themselves craving solitude will be reassured, comforted and informed by Storr’s words and those that are perhaps more extroverted will gain a sharp insight into other personality types.